How Do I Scan for Presets in SIGNAL? 1. Navigate to the Pulse Instruments' Page by clicking on the name of the preset which is currently loaded. 3. Click the '---SCAN---.nka' at the top of the Pulse Instruments list. 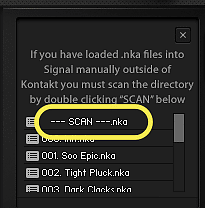 SIGNAL will check the Data > Signal Presets folder for new presets. After the scan, your Pulse Instruments list will be up to date. For a full overview on how to download and install Expansion Packs for SIGNAL, check out this video tutorial. I Just Saved a Preset in SIGNAL... Where Is It?